An Evening of Mad Science! 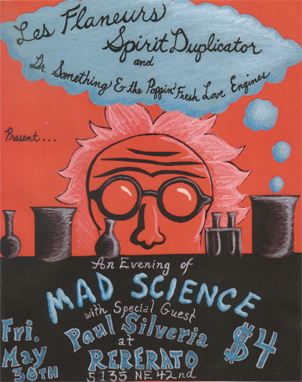 On Friday May 30th at 7 PM, Rererato Artspace will play host to AN EVENING OF MAD SCIENCE! *A chance to win fabulous prizes obtained from Portland’s finest garage sales in a game show hosted by the charasmatic and talented Paul Silveria.